Suurootan is an Altmer trader and the proprietor of Novaroma in Bruma. He sells general goods. The unique Monkeypants can be purchased here and nowhere else. He will also sell you the upgrades for your house in Bruma. The main trading room might resemble a typical Bruma living room, but Suurootan takes great pride in his shop and spends most of his waking hours maintaining it. He sleeps in the downstairs area with his wife, Karinnarre, every night between midnight and 6am. After waking up, he paces restlessly around the house for two hours before finally unlocking the front door for customers at 8am. He then proceeds to offer his services for the next twelve hours and locks the door again at 8pm. 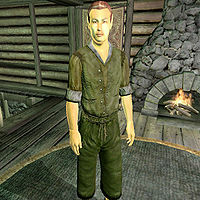 At that time he leaves the store and takes a relaxing stroll around Bruma until 10pm, when he enters Olav's Tap and Tack for a two-hour dinner. At midnight he heads back to Novaroma and goes to bed. Although he works hard every day of the week, Novaroma evidently does not provide much wealth for Suurootan. His wardrobe consists purely of lower-class items including a pair of green felt linens with a matching wool shirt and oiled linen shoes. He carries the shop key and a small amount of gold. When you enter Novaroma and approach him, he may introduce himself and his pride and joy: "I'm Suurootan, proud owner of Novaroma, a little piece of Heartland Empire here in the lofty Jeralls." When asked about Bruma, he will elaborate: "No need to go to the Imperial City. Bruma may look like a Skyrim town, but we've got all the comforts of the warm Nibenean south." After purchasing a house in Bruma, Countess Narina Carvain will direct you toward Suurootan: "I'm fairly certain that Suurootan at Novaroma here in Bruma can acquire the things you'll need to make it look like home." He is considered to be a bad bargain in comparison with other merchants. He is the only merchant with 600 gold who has a higher Mercantile skill than 30. Esta página foi modificada pela última vez à(s) 10h27min de 1 de janeiro de 2014.